You need to install a “trigger” script in your source control system to notify FogBugz whenever a check-in occurs that is related to a particular bug. You will have to implement this script yourself to integrate with whatever hooks, triggers, or APIs your source control system offers. RepositoryID is the ID of the repository you create in FogBugz. You can get this value from the New Repository dialog (see below). Log into FogBugz as an administrator and go to Admin -> Source Control. 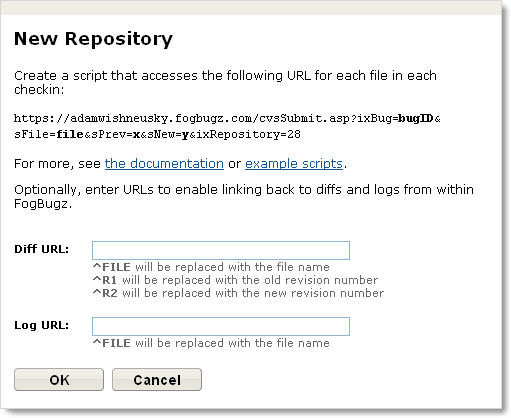 Click Create New Repository. In the resulting dialog, select Other (custom) as the type and give the repository a display name. Click Next. Under Diff URL, enter the URL of your source control system diff viewer. In this URL, ^FILE will be replaced with the file name, ^R1 will be replaced with the old version number, and ^R2 will be replaced with the new version number. Under Log URL, enter the URL of your source control system history viewer. In this URL, ^FILE will be replaced with a file name for which FogBugz wants to display the history.